This article is about the geopolitical entity created in Palestine under British administration. For the Mandate instrument passed by the League of Nations granting Britain a mandate over Palestine and Transjordan, see British Mandate for Palestine (legal instrument). 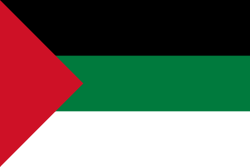 Mandatory Palestine (Arabic: فلسطين‎‎ Filasṭīn; Hebrew: פָּלֶשְׂתִּינָה (א"י)‎ Pālēśtīnā (EY), where "EY" indicates "Eretz Yisrael", Land of Israel) was a geopolitical entity under British administration, carved out of Ottoman Southern Syria after World War I. British civil administration in Palestine operated from 1920 until 1948. During its existence the territory was known simply as Palestine, but, in later years, a variety of other names and descriptors have been used, including Mandatory or Mandate Palestine, the British Mandate of Palestine and British Palestine. During the First World War (1914–18), an Arab uprising and the British Empire's Egyptian Expeditionary Force under General Edmund Allenby drove the Turks out of the Levant during the Sinai and Palestine Campaign. The United Kingdom had agreed in the McMahon–Hussein Correspondence that it would honour Arab independence if they revolted against the Ottomans, but the two sides had different interpretations of this agreement, and in the end the UK and France divided up the area under the Sykes–Picot Agreement—an act of betrayal in the eyes of the Arabs. Further confusing the issue was the Balfour Declaration of 1917, promising British support for a Jewish "national home" in Palestine. At the war's end the British and French set up a joint "Occupied Enemy Territory Administration" in what had been Ottoman Syria. The British achieved legitimacy for their continued control by obtaining a mandate from the League of Nations in June 1922. The formal objective of the League of Nations Mandate system was to administer parts of the defunct Ottoman Empire, which had been in control of the Middle East since the 16th century, "until such time as they are able to stand alone." 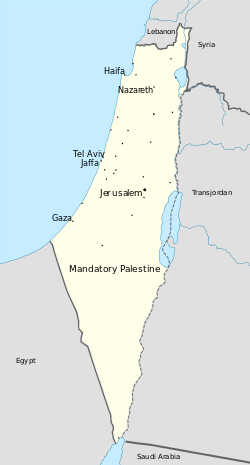 The civil Mandate administration was formalized with the League of Nations' consent in 1923 under the British Mandate for Palestine, which covered two administrative areas. 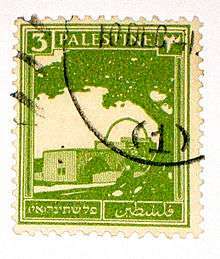 The land west of the Jordan River, known as Palestine, was under direct British administration until 1948. The land east of the Jordan, a semi-autonomous region known as Transjordan, under the rule of the Hashemite family from the Hijaz, gained independence in 1946. During the British Mandate period the area experienced the ascent of two major nationalist movements, one among the Jews and the other among the Arabs. The competing national interests of the Arab and Jewish populations of Palestine against each other and against the governing British authorities matured into the Arab Revolt of 1936–1939 and the Jewish insurgency in Palestine before culminating in the Civil War of 1947–1948. The aftermath of the Civil War and the consequent 1948 Arab–Israeli War led to the establishment of the 1949 cease-fire agreement, with partition of the former Mandatory Palestine between the newborn state of Israel with a Jewish majority, the West Bank annexed by the Jordanian Kingdom and the Arab All-Palestine Government in the Gaza Strip under the military occupation of Egypt. Following its occupation by British troops in 1917–1918, Palestine was governed by the Occupied Enemy Territory Administration. In July 1920, the military administration was replaced by a civilian administration headed by a High Commissioner. 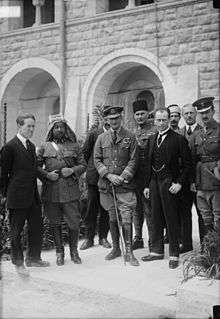 The first High Commissioner, Herbert Samuel, a Zionist recent cabinet minister, arrived in Palestine on 20 June 1920, to take up his appointment from 1 July. Following the arrival of the British, Muslim-Christian Associations were established in all the major towns. In 1919 they joined to hold the first Palestine Arab Congress in Jerusalem. Its main platforms were a call for representative government and opposition to the Balfour Declaration. The Zionist Commission was formed in March 1918 and was active in promoting Zionist objectives in Palestine. On 19 April 1920, elections were held for the Assembly of Representatives of the Palestinian Jewish community. The Zionist Commission received official recognition in 1922 as representative of the Palestinian Jewish community. One of the first actions of the newly installed civil administration in 1921 had been to grant Pinhas Rutenberg—a Jewish entrepreneur—concessions for the production and distribution of wired electricity. Rutenberg soon established an electric company whose shareholders were Zionist organizations, investors, and philanthropists. Palestinian-Arabs saw it as proof that the British intended to favor Zionism. The British administration claimed that electrification would enhance the economic development of the country as a whole, while at the same time securing their commitment to facilitate a Jewish National Home through economic—rather than political—means. 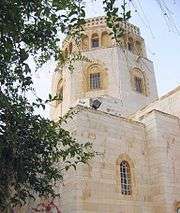 Samuel tried to establish self-governing institutions in Palestine, as required by the mandate, but was frustrated by the refusal of the Arab leadership to co-operate with any institution which included Jewish participation. When Grand Mufti of Jerusalem Kamil al-Husayni died in March 1921, High Commissioner Samuel appointed his half-brother Mohammad Amin al-Husseini to the position. Amin al-Husseini, a member of the al-Husayni clan of Jerusalem, was an Arab nationalist and Muslim leader. As Grand Mufti, as well as the other influential positions that he held during this period, al-Husseini played a key role in violent opposition to Zionism. In 1922, al-Husseini was elected President of the Supreme Muslim Council which had been created by Samuel in December 1921. The Council controlled the Waqf funds, worth annually tens of thousands of pounds and the orphan funds, worth annually about £50,000, as compared to the £600,000 in the Jewish Agency's annual budget. In addition, he controlled the Islamic courts in Palestine. Among other functions, these courts were entrusted with the power to appoint teachers and preachers. 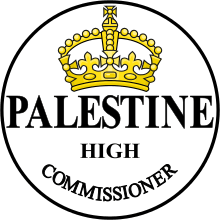 The 1922 Palestine Order in Council established a Legislative Council, which was to consist of 23 members: 12 elected, 10 appointed, and the High Commissioner. Of the 12 elected members, eight were to be Muslim Arabs, two Christian Arabs and two Jews. Arabs protested against the distribution of the seats, arguing that as they constituted 88% of the population, having only 43% of the seats was unfair. Elections were held in February and March 1923, but due to an Arab boycott, the results were annulled and a 12-member Advisory Council was established. 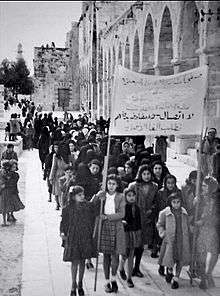 A 1930 protest in Jerusalem against the British Mandate by Palestinian women . The sign reads "No dialogue, no negotiations until termination [of the Mandate]". 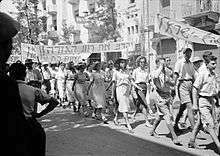 The Jewish Lehi (Fighters for the Freedom of Israel) and Irgun (National Military Organization) movements initiated violent uprisings against the British Mandate in 1940, in the former case, and in 1939, briefly, and 1944, for longer and on a larger scale, in the latter. On 6 November 1944, Eliyahu Hakim and Eliyahu Bet Zuri (members of Lehi) assassinated Lord Moyne in Cairo. Moyne was the British Minister of State for the Middle East and the assassination is said by some to have turned British Prime Minister Winston Churchill against the Zionist cause. After the assassination of Lord Moyne, the Haganah kidnapped, interrogated, and turned over to the British many members of the Irgun ("The Hunting Season"), and the Jewish Agency Executive decided on a series of measures against "terrorist organizations" in Palestine. 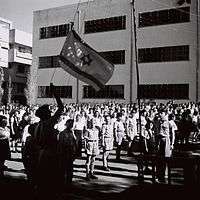 Irgun ordered its members not to resist or retaliate with violence, so as to prevent a civil war. The three main Jewish underground forces later united to form the Jewish Resistance Movement and carry out several attacks and bombings against the British administration. In 1946, the Irgun blew up the King David Hotel in Jerusalem, the headquarters of the British administration, killing 92 people. Following the bombing, the British Government began interning illegal Jewish immigrants in Cyprus. 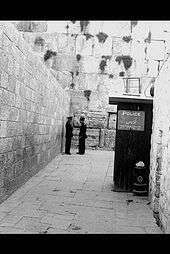 In 1948 the Lehi assassinated the UN mediator Count Bernadotte in Jerusalem. Yitzak Shamir, future prime minister of Israel was one of the conspirators. The negative publicity resulting from the situation in Palestine caused the Mandate to become widely unpopular in Britain, and caused the United States Congress to delay granting the British vital loans for reconstruction. The British Labour party had promised before its election to allow mass Jewish migration into Palestine but reneged on this promise once in office. Anti-British Jewish militancy increased and the situation required the presence of over 100,000 British troops in the country. Following the Acre Prison Break and the retaliatory hanging of British Sergeants by the Irgun, the British announced their desire to terminate the mandate and withdraw by no later than the beginning of August 1948. On 29 November, the UN General Assembly, voting 33 to 13, with 10 abstentions, adopted a resolution recommending the adoption and implementation of the Plan of Partition with Economic Union as Resolution 181 (II)., while making some adjustments to the boundaries between the two states proposed by it. The division was to take effect on the date of British withdrawal. The partition plan required that the proposed states grant full civil rights to all people within their borders, regardless of race, religion or gender. It is important to note that the UN General Assembly is only granted the power to make recommendations, therefore, UNGAR 181 was not legally binding. Both the U.S. and the Soviet Union supported the resolution. Haiti, Liberia, and the Philippines changed their votes at the last moment after concerted pressure from the U.S. and from Zionist organisations. The five members of the Arab League, who were voting members at the time, voted against the Plan. Some Jewish organisations also opposed the proposal. Irgun leader Menachem Begin announced, "The partition of the Homeland is illegal. It will never be recognized. 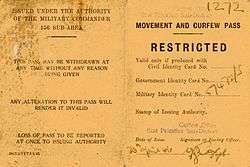 The signature by institutions and individuals of the partition agreement is invalid. It will not bind the Jewish people. Jerusalem was and will forever be our capital. 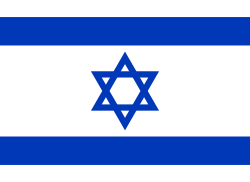 Eretz Israel will be restored to the people of Israel. All of it. And for ever." These views were publicly rejected by the majority of the nascent Jewish state. Immediately after the UN resolution, the 1947-1948 Civil War in Mandatory Palestine broke out between the Arab and Jewish communities, and British authority began to break down. On December 16, 1947, the Palestine Police Force withdrew from the Tel Aviv area, home to more than half the Jewish population, and turned over responsibility for the maintenance of law and order to Jewish police. As the civil war raged on, British military forces gradually withdrew from Palestine, although they occasionally intervened in favor of either side. As they withdrew, they handed over control to local authorities, and locally raised police forces were charged with maintaining law and order. The areas they withdrew from often quickly became war zones. The British maintained strong presences in Jerusalem and Haifa, even as Jerusalem came under siege by Arab forces and became the scene of fierce fighting, though the British occasionally intervened in the fighting, largely to secure their evacuation routes, including by proclaiming martial law and enforcing truces. The Palestine Police Force was largely inoperative, and government services such as social welfare, control of water supplies, and postal services were withdrawn. 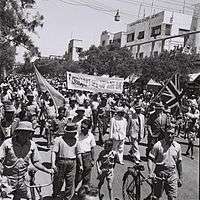 In April 1948, the British withdrew from most of Haifa, but retained an enclave in the port area to be used in the evacuation of British forces, and temporarily retained RAF Ramat David airbase to cover their retreat, leaving behind a volunteer police force to maintain order. The city was quickly captured by the Haganah in the Battle of Haifa. Following the victory, British forces in Jerusalem announced that they had no intention of assuming control of any local administrations, but would not permit any actions that would hamper the safe and orderly withdrawal of British forces from Palestine, and would set up military courts to try persons who interfered. 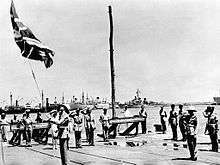 Although by this time British authority in most of Palestine had broken down, with most of the country in control of the Jews and Arabs, the British air and sea blockade of Palestine remained firmly in place. At the same time that the state of Israel was being declared the Haganah took over formerly British-controlled areas in Jerusalem. As the mandate era came to an end, radical Jewish forces, from whose actions the Haganah distanced themselves, began to clear Palestinian Arab communities in the area which would become Israel. On 15 May 1948, the Palestine Mandate ended and the State of Israel came into being. 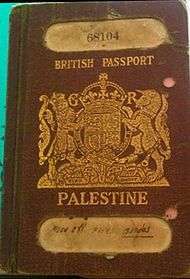 The Palestine Government formally ceased to exist, the status of British forces still in the process of withdrawal from Haifa changed to occupiers of foreign territory, the Palestine Police Force formally stood down and was disbanded, with the remaining personnel evacuated alongside British military forces, the British blockade of Palestine was lifted, and all Mandatory Palestine passports ceased to give British protection. 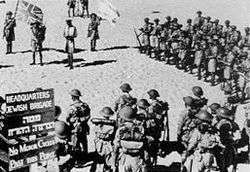 Over the next few days, approximately 700 Lebanese, 1,876 Syrian, 4,000 Iraqi, 2,800 Egyptian troops crossed over the borders and into Palestine (see 1948 Arab-Israeli War). 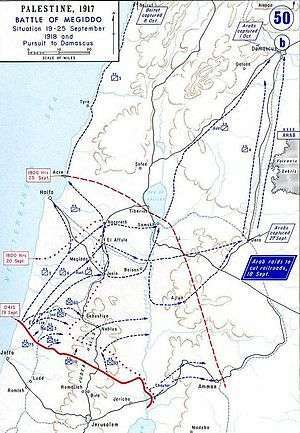 Around 4,500 Transjordanian troops, commanded partly by 38 British officers who had resigned their commissions in the British army only weeks earlier, including overall commander, General John Bagot Glubb, entered the Corpus separatum region encompassing Jerusalem and its environs (in response to the Haganah's Operation Kilshon) and moved into areas designated as part of the Arab state by the UN partition plan. In 1926, the British authorities formally decided to use the traditional Arabic and Hebrew equivalents to the English name, i.e. filasţīn (فلسطين) and pālēśtīnā (פּלשׂתינה) respectively. The Jewish leadership proposed that the proper Hebrew name should be ʾĒrēts Yiśrāʾel (ארץ ישׂראל=Land of Israel). The final compromise was to add the initials of the Hebrew proposed name, Alef-Yud, within parenthesis (א״י), whenever the Mandate's name was mentioned in Hebrew in official documents. The Arab leadership saw this compromise as a violation of the mandate terms. Some Arab politicians suggested that there should be a similar Arabic concession, such as "Southern Syria" (سوريا الجنوبية). The British authorities rejected this proposal. During the Mandate, the Yishuv or Jewish community in Palestine, grew from one-sixth to almost one-third of the population. According to official records, 367,845 Jews and 33,304 non-Jews immigrated legally between 1920 and 1945. It was estimated that another 50–60,000 Jews and a marginal number of Arabs, the latter mostly on a seasonal basis, immigrated illegally during this period. Immigration accounted for most of the increase of Jewish population, while the non-Jewish population increase was largely natural. In 1919, the General Secretary (and future President) of the Zionist Organization, Nahum Sokolow, published History of Zionism (1600–1918). He also represented the Zionist Organization at the Paris Peace Conference. The United Nations Special Committee on Palestine said the Jewish National Home, which derived from the formulation of Zionist aspirations in the 1897 Basle program has provoked many discussions concerning its meaning, scope and legal character, especially since it had no known legal connotation and there are no precedents in international law for its interpretation. It was used in the Balfour Declaration and in the Mandate, both of which promised the establishment of a "Jewish National Home" without, however, defining its meaning. A statement on "British Policy in Palestine," issued on 3 June 1922 by the Colonial Office, placed a restrictive construction upon the Balfour Declaration. 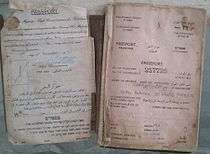 The statement included "the disappearance or subordination of the Arabic population, language or customs in Palestine" or "the imposition of Jewish nationality upon the inhabitants of Palestine as a whole", and made it clear that in the eyes of the mandatory Power, the Jewish National Home was to be founded in Palestine and not that Palestine as a whole was to be converted into a Jewish National Home. 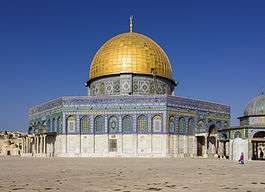 The Committee noted that the construction, which restricted considerably the scope of the National Home, was made prior to the confirmation of the Mandate by the Council of the League of Nations and was formally accepted at the time by the Executive of the Zionist Organization. In 1942, the Biltmore Program was adopted as the platform of the World Zionist Organization. It demanded "that Palestine be established as a Jewish Commonwealth." In 1946 an Anglo-American Committee of Inquiry, also known as the Grady-Morrison Committee, noted that the demand for a Jewish State went beyond the obligations of either the Balfour Declaration or the Mandate and had been expressly disowned by the Chairman of the Jewish Agency as recently as 1932. The Jewish Agency subsequently refused to accept the Grady Morrison Plan as the basis for discussion. A spokesman for the agency, Eliahu Epstein, told the US State Department that the Agency could not attend the London conference if the Grady-Morrison proposal was on the agenda. He stated that the Agency was unwilling to be placed in a position where it might have to compromise between the Grady-Morrison proposals on the one hand and its own partition plan on the other. He stated that the Agency had accepted partition as the solution for Palestine which it favoured. In 1920, the majority of the approximately 750,000 people in this multi-ethnic region were Arabic-speaking Muslims, including a Bedouin population (estimated at 103,331 at the time of the 1922 census and concentrated in the Beersheba area and the region south and east of it), as well as Jews (who comprised some 11% of the total) and smaller groups of Druze, Syrians, Sudanese, Circassians, Egyptians, Greeks, and Hejazi Arabs. The Mandate territory was divided into administrative regions known as districts and administer by the office of the British High Commissioner for Palestine. Literacy rates in 1932 were 86% for the Jews compared to 22% for the Palestinian Arabs, but Arab literacy rates steadily increased thereafter. Palestinian Arabs compared favorably in this respect to residents of Egypt and Turkey, but unfavourably to the Lebanese. ↑ Official Records of the Second Session of the General Assembly, Supplement No. 11, United Nations Special Committee on Palestine, Report to the General Assembly, Volume 1. Lake Success, NY, 1947. A/364, 3 September 1947, Chapter II.C.68. ↑ Palestine Jewry and the Arab Question, 1917 – 1925, by Caplan, Neil. London and Totowa, NJ: F. Cass, 1978. ISBN 0-7146-3110-8. pp. 148–161. 1 2 Segev, Tom (1999). One Palestine, Complete. Metropolitan Books. pp. 360–362. ISBN 0-8050-4848-0. ↑ Gilbert 1998, p. 85: The Jewish Settlement Police were created and equipped with trucks and armoured cars by the British working with the Jewish Agency. ↑ Why Italian Planes Bombed Tel-Aviv? ↑ Lenk, RS (1994). The Mauritius Affair, The Boat People of 1940–41. London: R Lenk. ISBN 0951880527. ↑ A. J. Sherman (2001). Mandate Days: British Lives in Palestine, 1918–1948. The Johns Hopkins University Press. ISBN 0-8018-6620-0. ↑ "The Mandate is Indivisble". 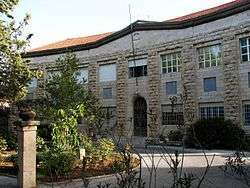 Historical Jewish Press, Tel Aviv University, Palestine Post. 9 April 1946. p. 3. ↑ Snetsinger, John (1974). Truman, the Jewish vote, and the creation of Israel. Hoover Press. pp. 60–61. ISBN 0-8179-3391-3. ↑ U.N. Resolution 181 (II). Future Government of Palestine, Part 1-A, Termination of Mandate, Partition and Independence. ↑ "Copy of telegram from Epstein to Shertok" (PDF). Government of Israel. Retrieved 3 May 2013. ↑ "PERMANENT MANDATES COMMISSION MINUTES OF THE TWENTY-SECOND SESSION". LEAGUE OF NATIONS. Retrieved 8 June 2010. ↑ Land Ownership of Palestine – Map prepared by the Government of Palestine on the instructions of the UN Ad Hoc Committee on the Palestine Question. 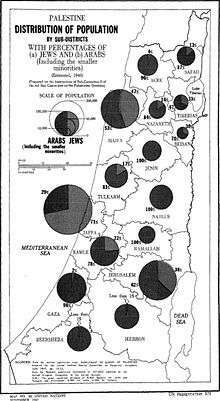 ↑ Mills, E. Census of Palestine, 1931" (UK government, 1932), Vol I, pp. 61–65. ↑ prepared in December 1945 and January 1946 for the information of the Anglo-American Committee of Inquiry. (1991). A Survey of Palestine: Prepared in December, 1945 and January, 1946 for the Information of the Anglo-American Committee of Inquiry. 1. Institute for Palestine Studies. pp. 12–13. ISBN 0-88728-211-3. ↑ UNITED NATIONS CONCILIATION COMMISSION FOR PALESTINE A/AC.25/W/19 30 July 1949: (Working paper prepared by the Secretariat),"The Arabs rejected the United Nations Partition Plan so that any comment of theirs did not specifically concern the status of the Arab section of Palestine under partition but rather rejected the scheme in its entirety." Khalidi, Rashid (2006). The Iron Cage: The Story of the Palestinian Struggle for Statehood. Beacon Press. ISBN 0-8070-0308-5. Retrieved 2 May 2009. Khalidi, Rashid (2007) [1st ed. 2001]. "The Palestinians and 1948: the underlying causes of failure". In Eugene L. Rogan & Avi Shlaim. The War for Palestine: Rewriting the History of 1948 (2nd ed.). Cambridge University Press. ISBN 978-0-521-69934-1. Retrieved 2 May 2009. Khalidi, Walid (1987) [Original in 1971]. From Haven to Conquest: Readings in Zionism and the Palestine Problem Until 1948. Institute for Palestine Studies. ISBN 0-88728-155-9. Retrieved 2 May 2009. Morris, Benny (2001) . Righteous Victims: A History of the Zionist–Arab Conflict, 1881–1999. New York: Alfred A. Knopf. ISBN 978-0-679-74475-7. Retrieved 2 May 2009. Biger, Gideon (2004). The Boundaries of Modern Palestine, 1840–1947. London: Routledge. ISBN 978-0-7146-5654-0. Retrieved 2 May 2009. Segev, Tom (2001) [Original in 2000]. "Nebi Musa, 1920". One Palestine, Complete: Jews and Arabs Under the British Mandate. Trans. Haim Watzman. London: Henry Holt and Company. ISBN 978-0-8050-6587-9. Retrieved 2 May 2009. Stein, Kenneth W. (1987) [Original in 1984]. 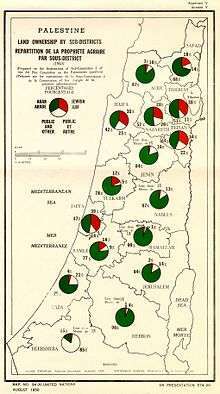 The Land Question in Palestine, 1917–1939. University of North Carolina Press. ISBN 978-0-8078-4178-5. Retrieved 2 May 2009. Gilbert, Martin (1998). Israel: a history. Doubleday. ISBN 978-0-385-40401-3. Retrieved 2 May 2009. Shapira, Anita (1992). Land and Power: The Zionist Resort to Force, 1881–1948. trans. William Templer. Oxford University Press. ISBN 0-19-506104-7. Retrieved 2 May 2009. Avneri, Aryeh L. (1984). The Claim of Dispossession: Jewish Land-Settlement and the Arabs, 1878–1948. Transaction Publishers. ISBN 978-0-87855-964-0. Retrieved 2 May 2009. Khalaf, Issa (1991). Politics in Palestine: Arab Factionalism and Social Disintegration, 1939–1948. State University of New York Press. ISBN 978-0-7914-0708-0. Retrieved 6 May 2009. El-Eini, Roza I.M. (2006). Mandated Landscape: British Imperial Rule in Palestine, 1929–1948. London: Routledge. ISBN 978-0-7146-5426-3. Retrieved 5 May 2009. Katz, Shmuel (1973). Battleground: Fact and Fantasy in Palestine. Bantam Books. ISBN 0-929093-13-5. Retrieved 2 May 2009.